Journal entries in Tally are the most widely used accounting entries after payment and receipt entries. Journal entries are used when there is NO involvement of cash or bank account in an accounting entry. Otherwise it would be payment or receipt entry. Generally, journal entries are created for closing books of accounts at the end of the year or for adjusting entries. Journal entries are an important ingredient of accounting in general as well as in Tally. You can imagine any entry that does NOT include the following accounts and it will be a journal entry. For example, if we take an entry of depreciation. As it is a non-cash entry and it does not involve bank, sales and purchase account as well, it will be journal entry. So, read the whole post to know everything about the journal entry and I am sure that at the end of this post you will surely know everything about journal entries in Tally. For creating journal entries in Tally, you have to select Journal Voucher from the available vouchers in Tally. From Gateway of Tally, you have to select Accounting Vouchers. Then from the green right hand sidebar, select Journal or press F7 for going into the journal voucher in Tally as shown in the picture. Now, we will create different journal entries in Tally as I have discussed above in the post one by one. I am sure you are going to enjoy it. Before we create journal entry for depreciation, we need to know the accounting entry for it. Let’s take an example of an asset called Furniture. We already have Furniture worth Rs.10,000 and we want to apply depreciation of Rs.1,000. Depreciation Account Debit by Rs.1,000 and Furniture Account Credit by Rs.1,000. If you don’t know how to create ledger for furniture or depreciation, you can go through this post in which I have explained in detail on how you can create ledgers in Tally. The entry for depreciation as I have shown in the above example will be as shown in the picture below. As you can see in the top left corner, it is journal entry. The value of furniture has been decreased from Rs.10,000 to Rs.9,000 because depreciation has been charged on the furniture. Now, let’s look at the second journal entry in Tally which is about accrued income. Accrued income simply means that you are eligible for the income but it is not received by you. Let me explain it you by giving an example which we will further use in the journal entry. For example, I have interest income from a person named Amit of Rs.1,000 but I have not received it till now. Therefore it will be an accrued income for me. Amit’s Account Debit by Rs.1,000 and Accrued Interest Income will be Credit by Rs.1,000. Please note that Amit can be my debtor or a person to whom I have given a loan and Accrued Interest Income will be my income. Journal entry in Tally for the above transaction will be as shown in the picture below. This is how the journal entry for accrued interest in Tally is done. If you want to create a journal entry for accrued expenses in Tally, exact opposite of the above entry will be done. Entry for accrued expense will be Accrued Expenses Debit and Amit’s Account will be Credit. Easy, isn’t it? Let’s move on to the next journal entry of Purchase on Credit. When we purchase something on credit, you can even create a Purchase Voucher in Tally. But for this example, we will create a journal entry. Did you guessed the journal entry for credit purchase? It’s easy. For example, if I purchased from Amit on credit goods worth Rs.5,000. The journal entry will for this transaction will be as under. Purchase Account Debit by Rs.5,000 and Amit’s Account Credit by Rs.5,000. Please note that in this case, Amit will be my creditor as I am purchasing from him on credit. This is a simple purchase entry. If you have purchased different items and want to include it in the entry, that is also possible. But for the sake of simplicity, I have not included it in the entry. Now, let’s move on to the last journal entry which is Sales on Credit. As I said while creating journal entry for purchase, it can also be created in Purchase Voucher. Similarly Sales entry can also created with the help of a Sales Voucher. But for this post, I will be creating a simple journal entry for sales in Tally. Let’s take the example as usual. For example, I sold some goods worth Rs.6,000 to Amit. Guessed the journal entry? Let me give you a hint. It will be exactly opposite of the journal entry for purchase on credit which you just read above. Okay, let me tell you. It will as under. Amit’s Account will be Debit by Rs.6,000 and Sales will be Credit by Rs.6,000. In this case, Amit will be my debtor as I am selling goods to him. Now let’s look at the actual journal entry in Tally. Journal entry in Tally for the above transaction will be as shown in the picture below. Click here on the image to see it clear. Again this is a simple sales entry and obviously you can include stock items, taxes or other expenses if you want. I have for the sake of simplicity not included here. 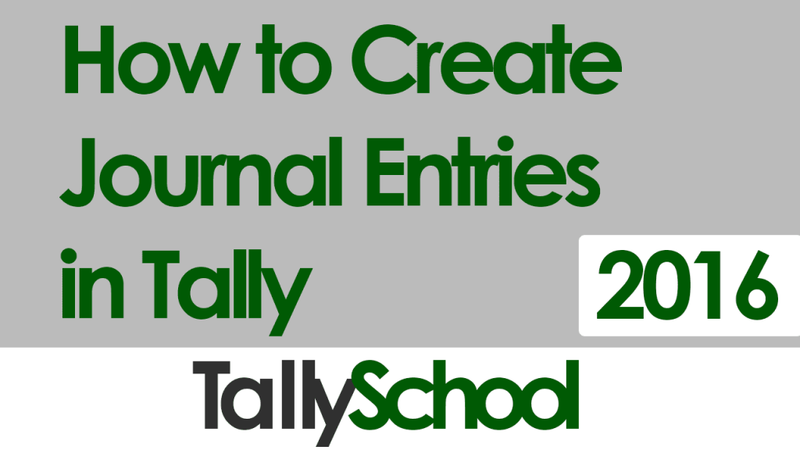 These were the major journal entries in Tally you can create easily. Of course, there will be many more journal entries, but these were the major ones. If you learn all four of them, you are good to go for your daily accounting transactions in a normal business. Journal entries are an inevitable part of accounting. Just like water is an important resource for the survival of human beings, journal entries are that much important for accounting. If you can remember, the first time when we learn accounting in school in 11th standard (at least, I learned it in 11th), first kind of entry we are taught is a journal entry. And there is a reason for that. Because they are important. They are the foundation of double entry system of accounting. If you have any difficulty or suggestion, please comment down below and I’ll address each of them. I am happy that you liked the way of explaining. I will create more posts and videos like this. Rishith!Really simple to digest.liked it. Expecting more typical like transactions with taxes(VAT/CST),Freight. I want to learn fast as joining in an office. For taxation part and other advanced levels, you have to buy DVD. Thank you so much Sir for your simple examples…. Plz give us examples for VAT entries and also plz post few difficult entries to learn more…. For taxation part, you have to purchase the Tally DVD Course. I have been looking for this answer since long. Today I came across your posting on journal entry. I have grasped the knowledge of Journal entry today. Thanks to you. You are genius. Thank you so much Jangi Lal Sharma for your good words. In fact, I am just like you. The entries that I have explained covers all the entries that you have said. You just have to know a little bit of basic accounting to pass the entries. By the way, the entries you have written are NOT journal entries. I considered Pen as an Asset and not an Expense. That’s the reason why I debited Pen A/c. If i receive professional services than what entry we make . secondly if i give professional services than what entry me make in which vouucher. When you receive professional services you will pass payment entry and when you give professional services, you will make sales entry as now it will be sales for you. You can actually use Tally in any company. 1) when i purchased the goods, vat, c.s.t, service tax, c/excise. etc. may be charges with the taxable amt. similarly, when i sales the goods those are same charged with the taxable amt. what is the journal entries ? 2) when i am paid any kind of tax at first i show the payable of tax, and then paid the tax, what is the journal entries? and in the time of salary at first i show the payable then i paid why ? and what is the journal entries ? similarly, at the time of other cash exp.i show only paid not payable why? and what is the journal entries ? Pls. send the answar at my user ID which is mention below. For taxation purposes you have to buy the DVD Course. I confuse that in which under i have to put depreciation in tally? like capital under capital account ,then depreciation under? Depreciation will go under the head Indirect Expenses. Now a days im doing a job and all my work comes under tally. So, ur posts and blogs helps me to my work . Thanks buddy, Keep updating us. Thank you for your kind and good words. sir ,it would give me more knowledge about entries if you please put some real bank statements. Coz im facing little bit of problem while bank entries. Hi bro .. can u tell how to differentiate direct and indirect expense and income? I will create a post on this. Thanks for asking. When i give an advance(Cash) to an employee for incurring certain expenses then i shall enter that transaction as Payment. But if later he returns me some amount out of what i gave him and gives rest expense details, then the cash i received back from him now will be in receipt or journal? Please explain this entire situation with entries too that i will do in tally and in which voucher type. For this type of situation, I have created another post. Hi bro, I learnt alot from your posts. keep posting & helping us like this. The expenditure entry is same as any other expenditure. Have a look at the journal entry or payment entry on TallySchool. Is purchase voucher can be done instead of journal entries? is it right or wrong! You can definitely do purchase voucher instead of journal entries. It is not at all wrong. Just another way of passing entries. I liked the way you’ve explained the concept with screen shot. But, if you would have included the tax concept into it, then would seems to be much better. I have explained whole of the taxation concept on the DVD Course. So it is not on TallySchool. My question is that if i purchased one too more items than tracking no is used in serial or not. There is a voucher number which you can enter while passing the entry for the vouchers and then you can track them. Thank you so much Jenish! I am happy bro! Start from the Free Tally Course Online in which I have explained everything step by step. You’ll really find it awesome. You cannot maintain a journal entry in office. It is called a journal account and it is necessary because some accounting entries in Tally requires journal entries to be created.